I am making preparations for a “fabulous fall” party next week on the blog, where I will be teaming up with a few other spectacular bloggers to show you how to bring the outdoors inside for fall decorating. 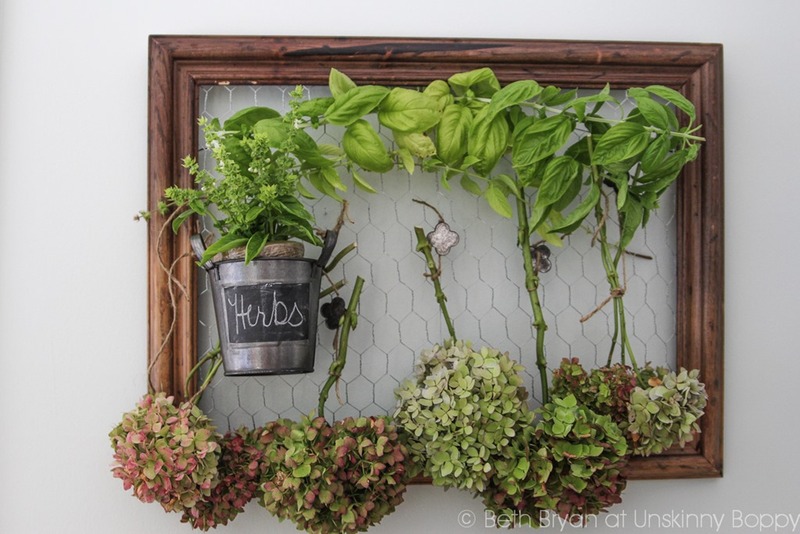 Today, though, I wanted to show you this simple herb drying rack that I made using chicken wire and a picture frame and talk about the best way to preserve hydrangea blossoms. The rack itself is super simple. Find an old wooden picture frame at the thrift store (or maybe your attic?) and staple chicken wire to the back of it, then attach a wire hanger. That’s it. Nothing too earth shattering, right? I don’t have step-by-steps of the process, but I have confidence that as a long time DIY blog reader you can figure it out. For the past few weeks every time I watered my plants I looked at the hydrangeas that were fading from their summer glory and made a mental note to try to preserve them before they were too shriveled up to use. Today was finally that day. 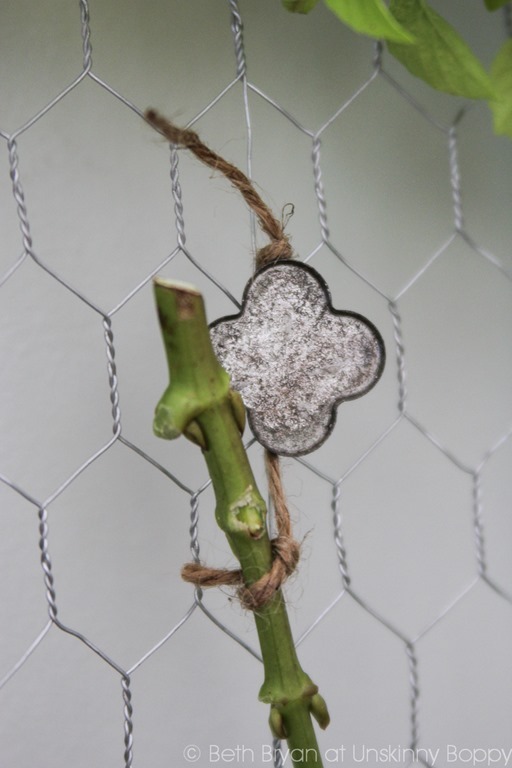 To hang them I simply tied a short piece of twine around the stem, then clipped the twine to the chicken wire to hold it in place. Hydrangeas are some of the easiest flowers to preserve, but there are a few things you need to remember when drying them. 1. The main thing to remember is to WAIT! Just wait until late summer or early fall to cut the blooms off the plant. By allowing the plant to do most of the drying process for you naturally, you’ll have a hearty hydrangea bloom that will last for years. 4. Hang them upside down to avoid floppy heads if the stems are weak. You can also just stick them in a vase and let them do their thing, but here is a warning if you do that. They will never be separated easily again. By drying them in bunches you can have separate bundles to use in different arrangements later. So, now is the time to harvest your hydrangeas for fall decorating. See you back here at the fabulous fall party next week, September 25th! « Surprise! It’s a virtual baby shower! It all looks so pretty hanging there too. Great ideas. 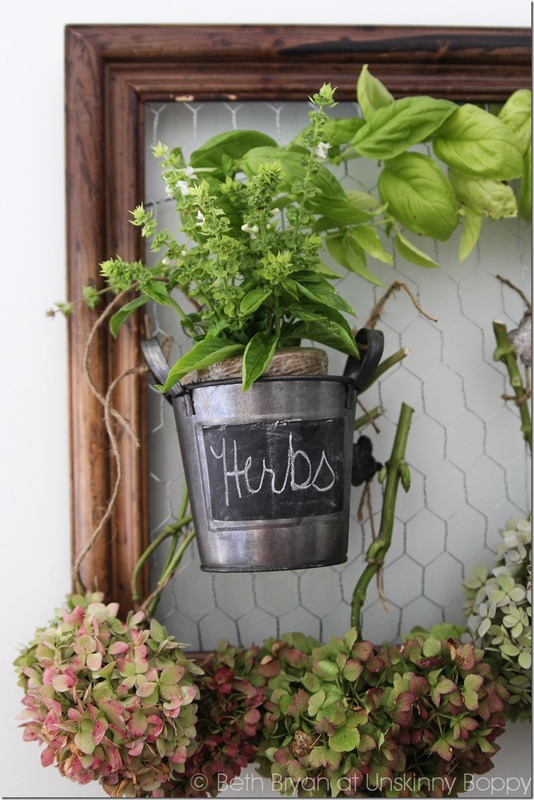 Your drying rack looks gorgeous, love your bucket with herbs also. I’ve been going to drag out one of my old frames to put some chicken wire on it to do whatever with it. Wish I had some hydrangeas to hang from it. Hard as heck to grow them here, climate is too dry. I’d sure love to tho, faux hydrangeas just don’t do it for me. When we lived in KY growing Hydrangeas was easy. You name it we had the plants that grew wild mostly. When we cleaned out some hedges and trees from one side of our yard we found hosta plants, lilies, had forsythia bushes in front yard along with daffodils and tulips. Only thing is humid climate doesn’t agree with asthma, allergies and arthritis. I still miss our house and land there, had 1 1/2 acres with old trees, honeysuckle, boy was i allergic to that, smelled so pretty tho.